It’s the time of year when people post their year in review to remind awards’ voters what’s out there that they might have missed. Here’s what Team Space Unicorn did in 2014. We appreciate your consideration. The short stories listed below are eligible in the short story categories of the SF/F awards. If you are a SFWA member nominating for the Nebula Awards, you can find an eBook copy of these stories in the SFWA Forums. We also published poetry that is eligible for the Rhysling Awards! Our nonfiction from issue 1 counts towards those writers’ eligibility for Best Fan Writer awards (Sarah Kuhn, Tansy Rayner Roberts, and Christopher J Garcia). Our Managing Editor, Michi Trota, is also eligible in the Best Fan Writer Hugo Award category for her blog and contribution to Jim C. Hines’s Invisible anthology. 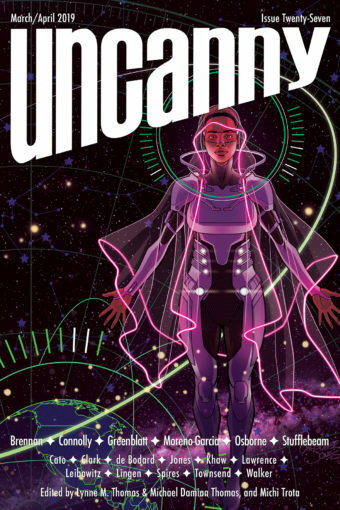 Thanks to her previous work and Uncanny Issue One, Lynne also once again meets eligibility requirements for the Best Editor, Short Form category of the Hugo Awards. 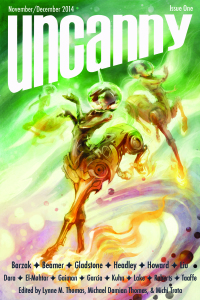 Uncanny‘s Lynne, Erika Ensign, and Deborah Stanish’s Verity! Podcast (which was also nominated for Best Fancast in 2013) had an awesome year, and we encourage you to check it out if you are so inclined. Podcast co-producer Steven Schapansky’s Radio Free Skaro podcast is also eligible for podcasting awards.